Amidst all the reporting on this or that test market getting 5G connectivity from Verizon, AT&T or T-Mobile, and the onslaught of 5G phones that is arriving next year, it's easy to forget that for most folks this is not a household word. The latest survey by research firm RepeaterStore took the topical knowledge of 1,039 American adults in a "nationally representative sample," only to make clear that people don't really care about 5G all that much at the moment. 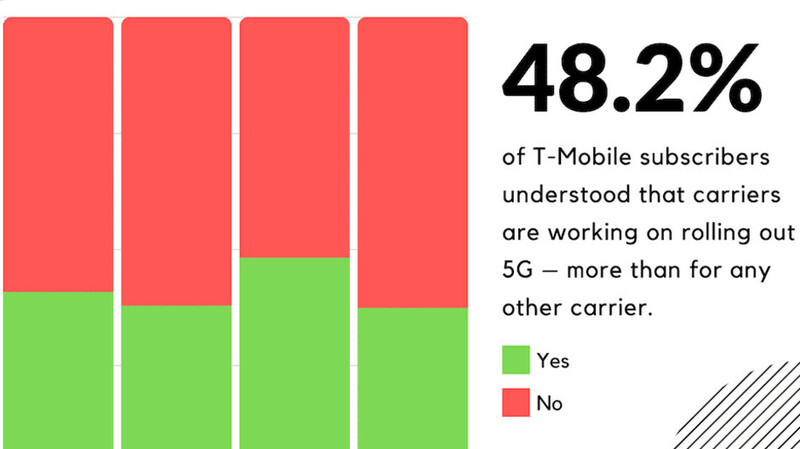 Almost 60% didn't even know that Verizon, AT&T, T-Mobile, and Sprint are working on bringing faster and better cellular connectivity to the unwashed masses, imagine that. The funniest part is that T-Mobile's subscribers were most in the know (48%), while Verizon's, whose commercial 5G network is already operational in testbed locations, came third, only a hair before Sprint's users. The 5G awareness issue may simply be a question of marketing policies, as T-Mobile has been very aggressive in touting the next-gen standard virtues, especially in light of its eventual merger with Sprint. Just 20$ of the people surveyed, however, are in sync with the benefits that are expected with the 5G rollout, and a full 38% aren't even that excited to learn about it. When asked about the quality of the cellular signal in their home or workplace, the tallest graph bar falls in the "average" category, except for Verizon users in the "at home" scenario. Those results could mean that the US carriers still have some more work to do to tout the benefits of 5G and make people switch their broadband connections from cables to the towers. 4G isn't even mature yet. All this new technology and we only see about 5% of the theoretical limits of it, on average. "Just 20$ of the people surveyed"
Apple tends to wait until the technology can be better implemented. Just because a phone is the first to something doesn't mean it's great. Look at the HTC Thunderbolt and how it did being one of the first LTE phones. Not saying Apple is this revolutionary company, but they make tech that works. Translation :Apple waits until others do the work, then jump on the bandwagon (and sometimes try to patent the work, as well). I had the Thunderbolt. It was a good phone, other than the battery life. I remember everyone at work using my phone to stream YouTube or other videos because it was the only one that didn't buffer constantly. Did you see the ;) winky face? Or maybe I should have put /s to make it not as subtle? Are you certain that these surveys were mostly iPhone users? Where's your credible evidence then? People who are turning this into an Apple vs Android debate sound like morons. Never got any survey about 5G.... never heard of 'RepeaterStore'. It's not a big deal. 4G is more than enough. Generally Americans do not have high knowledge about tech. Europe is more advanced regarding these kinds of things. I agree that Europeans are more educated, but most advanced tech companies are from US.